With the cost-to-market for an FDA approved drug at an estimated $1 Billion and nearly one-third of its patent life currently spent in R&D, the pharmaceutical industry battles profitability and return on investment in its research labs on a daily basis. Xyntek aims to assist companies in establishing a technology roadmap to leverage a combination of cutting-edge technology and integration of proven systems to maximize efficiency in moving drugs through R&D and into the clinical space. 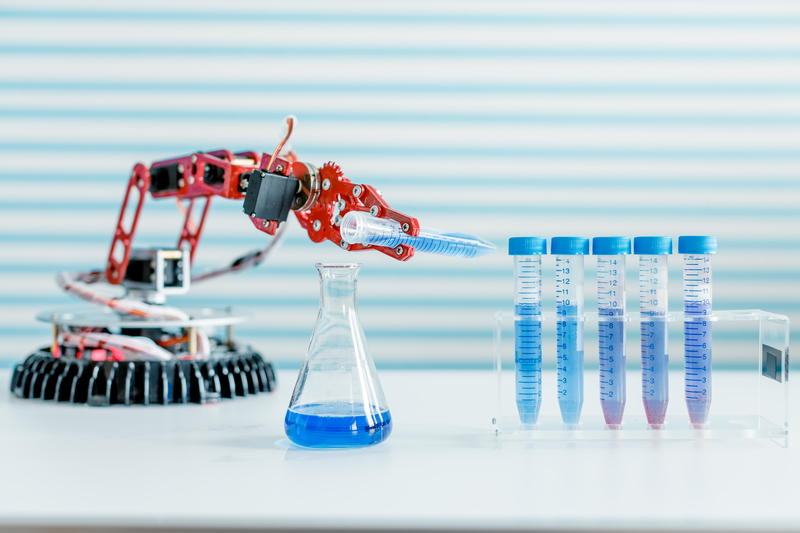 There are three main aspects to a successful Lab Automation Implementation effort, all with equal importance and aimed at the goal of maximizing the efficiency and output of each and every scientist. First is the ability to identify the need and potential for technological assistance to streamline a process. It follows that the next is establishing the end goal of the effort, including understanding the requirements of the system, as well as its limitations. Finally comes execution - making it happen through process analysis and meticulous design. A high level overview of our services in this area include instrument selection, system design, and integration of a large variety of lab instruments including, but not limited to plate handlers, liquid handlers, refrigeration & storage, barcode printers & scanners, heaters, chillers, and centrifuges. Xyntek also engineers custom software and integrated systems involving a variety of robotics platforms for laser pointing identification, vision, compound management and retrieval, inventory management, etc. Connecting instruments by customizing scripts, drivers, and protocols are among Xyntek's value-add in this space. A typical LIMS solution implements the following core functionality: Instrument analysis, Data Analysis, Data Reporting, Lab Management Functions and System Management Functions. In addition to the above mentioned core functionality, some LIMS solutions offer instrument control, sample scheduling, quality control (QC), materials management & inventory, and web-based reporting functionality. Studies have shown that LIMS implementations have been a pivotal reason Pharma R&D operations have achieved greater efficiency and higher yield. However, selecting and integrating the most appropriate LIMS solution is critical in realizing these potential upsides. In addition to selecting a LIMS with the best out-of-box functionality, the integration with other systems such as Electronic Lab Notebook (ELN) and sample/compound management is equally as important to a successful solution. Xyntek’s expertise as a premier LIMS solution provider and preferred integrator for numerous LIMS solutions gives piece of mind that the proper system is implemented at the highest level of quality. Our software team develops custom solutions based on specific needs found in the lab space that can be adapted and leveraged across the industry. Versed in a variety of object-oriented & scripted languages and database technologies, we have the tools and partner relationships with industry leaders to customize and enhance off-the-shelf applications, including ELN, LIMS, and sample & compound management systems. Special situations and environments dictate a web-based versus a client application, and whether data management is most appropriate as a local or hosted database. Xyntek has built numerous modules and thoroughly tested libraries that are used to provide reliable and cost-effective rapid application development solutions. Documentation and testing are the cornerstones of the software development practices used to deliver our trusted applications complete with a full package of design documents and repeatable installation and test protocols. 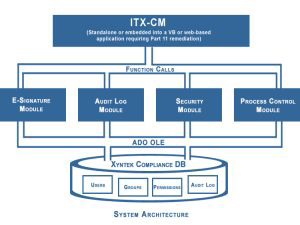 To provide FDA regulated companies with an easy and reliable technical remediation solution, Xyntek has developed a suite of configurable software modules, that facilitates and expedites compliance of your custom or off-the-shelf software applications with 21 CFR Part 11 practices by providing security, audit log generation, process control, and E-signature capture. The solution provides a flexible means of using existing databases or numerous data sources as a repository for various compliance pieces, though a custom integrated database is available to acting as the central repository for all modules. With years of experience and unique expertise in regulatory compliance in the R&D lab space, Xyntek compliments its integration services by providing on-site validation support for instruments, LIMS, or other GxP applications. Using proven GxP compliant test protocols, system-specific qualification protocols, as well as executed Installation, Operational, and Performance Qualification (IQ/OQ/PQ) protocols to ensure that the system was compliant with the 21 CFR Part 11 regulations, no detail is overlooked by our full suite of validation and support services.